Michigan | Stop Dog Whistle Racism! PrezVid: With Friends Like These . . .
conservative Judicial Confirmation Network goes up today with an ad reminding voters in two key states about Obama’s ties to Tony Rezko, Bill Ayers and Jeremiah Wright. Representatives for the group say it will be a “$1 million ad and grassroots effort” around the veep debate tomorrow and the opening of the new Supreme Court session Monday. It will air on networks in the smaller and more inexpensive markets across Ohio and Michigan. In Ohio, Zanesville, Lima, Toledo, Youngstown, and Wheeling-Steubenville. In Michigan, Marquette, Traverse City-Cadillac, Lansing, Kalamazoo-Battle Creek, Alpena. They’re also buying time in Erie, Pennsylvania. The conservative group Judicial Confirmation Network is launching a new television ad in key battleground states Wednesday that in part features Barack Obama’s ties to the Rev. 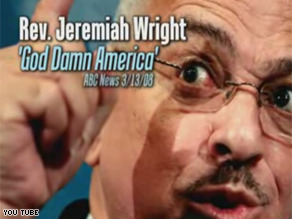 Jeremiah Wright, the controversial pastor who nearly derailed the Illinois senator’s presidential bid last spring. The independent ad is the first campaign spot in the general election to highlight Obama’s lengthy relationship with Wright, a subject that generated considerable media scrutiny during the primary season but one John McCain has said should not be an issue in the race for the White House. A spokeswoman for the group says more than $500,000 is being spent on the ad, which is set to run in Ohio and Michigan markets through Election Day. It will also run nationally on Fox News during the upcoming debates. A self-avowed member of the Klu Klux Klan, Randy Gray of Midland, is the second newly elected Republican precinct delegate in Michigan who has ties to white supremacist organizations. Gray was elected by Midland County Republican voters to serve the party in Midland County. The other newly elected Republican official is Kyle Bristow. He is the newly minted Clinton Township (Macomb County) Republican precinct delegate and is the former chair of the Michigan state chapter of Young Americans for Freedom (YAF), which the Southern Poverty Law Center lists as a hate group. In a report from Media Mouse (a West Michigan news blog), Gray said that all he had to do was put his name on the ballot and that he did not campaign for the position. The Media Mouse report includes a screen shot of Gray bragging about his victory on the message board of a white nationalist Web site, Stormfront.org. There is no evidence available whether Bristow campaigned for the position, either, or, similar to Gray, merely applied successfully to get his name on the ballot. In his new position with the Republican Party, Gray reports to Midland County Republican Chair Diane Bristol. When called for comment, Bristol told Michigan Messenger, “If, in fact, he’s associated with the KKK, [then] yes, it troubles me.